Participants were asked to describe a personal event that affected one's "emotional bank account." One administrator recounted a recent trip he took with three generations of family. As he looked at his small son playing nearby, he confessed to his dad, "Gosh, I can't believe how much I love him." His own father laughed. "If you think you love him now, just wait thirty years." As we drove along, we both discreetly grabbed the fast food napkins stashed in the door pocket. My husband, for the grandpa who never lived to see his grandson, and I, for the father who walked away. It's times like Father's Day when I'm grateful we can experience the flip side of this coin, the profound and redemptive love we have for our children. Just imagine how 30 years will deepen our love for them. I started to add another paragraph about finding the Father to the fatherless, but Barbara Curtis at Mommylife already said it so beautifully, I'll send you there instead. Thank you so much for this beautiful post, Meredith. It made me cry. And I think it is a very fitting post on your blog, too. The thriftiness and saving money is only a means to a greater end: that of being home and available to your family as much as possible during these fleeting, short years when your children are at home with you. Wishing you a wonderful day with your family. Heart-achingly beautiful - both the post and the sweet, vulnerable baby and daddy photo... thank you so much for writing that! 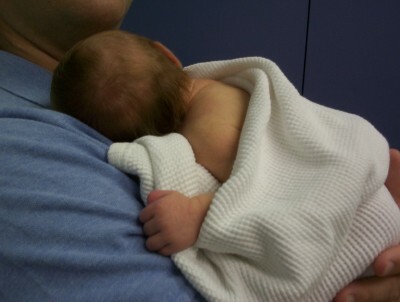 That picture is awesome - nothing like holding your very own newborn baby while she sleeps. I just stopped by to say congratulations and catch up on your news. I have been out of town on vacation. Your newest miracle is beautiful. Praying that her bili levels are normal soon. I am so happy for you and your husband for now being proud parents of two. Your husband seems like such a great dad--you are really blessed. My husband's dad left when he was 12 and my father passed away suddenly last Oct. Yesterday was sad for us when we thought about our fathers. I check your blog every day when I can. I really like that you put pictures of everything, and this one is so sweet. Frame it! What a beautiful picture! My father died when I was 4. My grandfather did his best to take his place. The relationships between Dads and daughters is so special. Something to be cherished.